There is no established history of how broad-winged raptors will migrate through Britain. We start therefore with some models, with respect to the Honey-buzzard movement, including those which are the logical consequences of how other workers have interpreted the data. It is clearly necessary to have an idea from whence the birds come. So we look at studies done on raptor migration through Western Europe, through satellite tracking of individuals and observations at observatories. We also look at studies on breeding populations in Scandinavia and elsewhere in Europe, looking for correlations with trends in migration numbers in the UK. Below three potential models are described for the migration of Honey-buzzard through Britain. The Southwards Model is very simple consisting of a single line. In this model it is thought that Honey-buzzard have a strong southward urge in their migration, with deviations only to avoid water crossings. For juveniles the southwards thrust is thought to be an instinct. Adults in moving south also use their experience to select the best route, such as to avoid long sea crossings of the Mediterranean which consume valuable fat reserves. So there are massive concentrations of the birds in autumn at Gibraltar and the Bosporus. Physics therefore supports this model as it is energy efficient, helping the birds to survive the migration. The model is also supported by observations across the whole of continental Europe: except for detours around water, the direction is south. The model does require a source, that is sizeable populations of Honey-buzzard in northern Britain, but these have been found in Northumberland, Cumbria and Scotland where a population of 50 pairs was postulated in Birds of Scotland. The actual figure for Scotland is surely much higher. The model matches reality as Honey-buzzard populations in northern Britain were very small until the early 1990s, then increasing steadily until the present time. The extent of the movement seen each year will vary with productivity, weather and observer effort. High numbers of juveniles produced, as in 2008, increase the size of the movement. Winds against force the birds lower to the ground and slow down their exit as in 2000. Once a significant movement has started, the speed of modern communications ensures that observers are soon scanning the skies for more (as in both 2000 and 2008). A modification of this model was developed in 2012 to bring it closer to the physics. In particular two different modes of lift were identified for Honey-buzzard – thermal and orographic – with the latter considered more important in the autumn movements as the sun is becoming weaker by mid-September. Under normal autumn conditions of fresh W winds over the Pennines the Honey-buzzard will use orographic lift to quickly navigate the hills. If suitable W winds do not occur, the birds will wait but may leave on the onset of E winds to the east coast both for orographic lift on the wind striking the coast and for navigation in the often ensuing dull conditions. The significance of orographic lift is discussed in detail in section 1.2, with a map of the suggested southwards routes through the UK, one leaning to the W on westerly wings and the other to the E on easterly winds. People who speculate that the Honey-buzzard migrants come from the continent are often assuming a migration pattern like that in the N model. So after building up fat reserves and moving S in economical soar-glide mode, the birds then move NW across the North Sea consuming 20 times more energy per kilometre in flapping motion over water than soar-glide over land and exhausting their fat reserves. Without any ado (rather like the killer picking himself up in the film Halloween!) the birds then fly S as if nothing has happened, in soar-glide motion again. This scenario is ridiculous. If a bird did manage to cross the North Sea this way, it would be exhausted and would have to replenish its fat reserves before resuming migration. So we should have seen hundreds of disoriented birds keenly feeding in woods and fields in NE England. There are no such reports. The pattern above increases strongly the likelihood of a failed migration, leading to the death of the bird. Neither adults (who know the way) nor juveniles (who have a strong instinct to go S) would allow themselves to be drifted this way. Any model should be testable. The N model can certainly be tested on a pretty good series of data going back to the start of the 20th Century. The model has a mismatch with reality in all but 2 out of about 110 years with no significant Honey-buzzard movement in Britain being very much the rule. Northern European populations have been fairly stable during this period, even declining to some extent recently, so these are approximately a constant. In 2000 and 2008, there have been significant movements in Britain but these have been associated with the absence of source populations on the near continent, no records from North Sea oil rigs (in 2000 and 2008) and apparently fit populations on southward migration in Britain. The model also involves the birds in a very dangerous migration strategy by the laws of physics. Realising the problems with the N model, a few proponents of a continental origin have produced a vaguer model in which somewhere to the east, perhaps a long way off, the birds are somehow hoovered up into the sky by some freak weather and forced to circle around for a number of days, before landing on the east coast of Britain in pristine condition. The rules of this model are that the origin of the birds is unknown, the birds cannot land anywhere between their origin and Britain and the time in the air need not be specified. 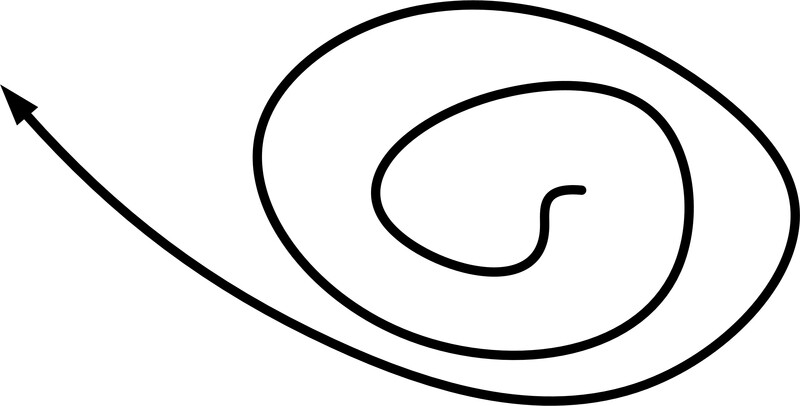 This model is termed the Spiral Model. Like the N model this model has only matched reality in 2 out of the last 110 years. It could be argued that it cannot be ruled out but this is because the model is so vague that it cannot really be tested. From the physics viewpoint, this model is very unsatisfactory: how do the birds survive such a long time in the air without food? Really this model is so fanciful and weak that it is better classified as faith, not science! Newton (1979, p.195-196) gives the basic situation: “the second group includes the broad-winged raptors, such as eagles, vultures and buteonine hawks. They perhaps expend less energy on migration but, being more dependent on updraughts or thermals, they are obliged to make as much of their journey as possible overland, on what is often an indirect route taking advantage of land bridges or short sea-crossings. In the absence of mountain updraughts, they are also restricted to the middle part of the day, when thermals are best developed”. Alerstam (1990, p.261) considers in more detail the conditions for soaring flight: “By soaring the birds make the most of the free energy in upwinds. These they can find at hills and mountain slopes where the wind is deflected upwards, as well as in 'lee waves' which are formed beyond the lee sides of mountains. Birds which soar and glide over longer distances, however, as a rule rely not simply on upwinds at hillsides and in lee waves but benefit primarily from the rising air of thermals”. Honey-buzzard arrive on migration in northern Europe typically in May and early June. At this time the sun is relatively hot and the days long, permitting long-distance movements through soaring on thermals (thermal lift). The breeding season is one of the latest for any species in Europe but in many areas is still complete by mid-August, enabling at least many adults to depart in the same way as they arrived, through thermal-lift. In the extreme north and north-west of their range, fledging may not occur until late August or early September and the birds may not depart until mid-September. By this time thermals are becoming much weaker and are restricted to perhaps only a few hours in the middle of each sunny day. Sunny days themselves may be scarce and the limited time available each day will delay the exit of the birds. To facilitate their exit, the birds may use other forms of available energy such as orographic lift, the meteorological term for updraught caused by the wind blowing into a hill or a mountain. Orographic strictly refers to mountains but any ridge or obstruction, such as a cliff, can be used beneficially by the birds; hence equivalent terms are ridge lift and obstruction lift. This energy is available through the whole day thus giving the birds a much longer flight period. Alerstam (1990, p. 271) describes the best known raptor migration site in the world where orographic lift is employed: “Raptor watching is a popular pastime in North America. The most important observation points are Hawk Cliff, ..., and Hawk Mountain in the north Appalachians, where the raptors follow the mountain slopes that have the best upwinds”. Hawk Mountain is of most concern here, representing one point along the Appalachian range which is aligned SW-NE from Alabama (USA) to New Brunswick (Canada). In some cases migrating raptors soar and glide for hundreds of kilometres along terrain features that produce updraughts, for example, along the parallel ridges of the Appalachian Mountains (Mandel et al, 2011). Work in eastern USA (Bohrer et al, 2011) showed that Turkey Vulture nearly exclusively used thermal lift, whereas Golden Eagle primarily used orographic lift during migration. The same study showed that the strongest orographic uplift is associated with strongly negative thermal uplift, because the strong winds required for orographic uplift produce shear that tends to break apart thermal formation. Golden Eagle were often observed in the study area migrating in late autumn on days with high winds and heavy overcast conditions that immediately follow the passage of regional cold fronts. In Europe most attention has been paid to thermal lift, with many studies around the Mediterranean where the sun is relatively strong and the summer season long. However, with the rapid development of wind farms, it is necessary to develop models of the risks associated with birds colliding with the blades. In such models it is necessary to include both thermal and orographic lift. Migratory large raptors breeding in northern Britain number just two: Osprey and Honey-buzzard. The former is not a typical broad-winged raptor migration-wise being capable of long sea crossings with much flapping flight; the Osprey perhaps should not be classified anyway as a broad-winged raptor as it has narrow wings with only 4 protruding primary tips visible in flight. The Honey-buzzard is a typical broad-winged raptor migration-wise, avoiding long sea-crossings and concentrating at places such as Gibraltar, Sicily and Malta to minimise each leg over the sea. In Northumberland the Honey-buzzard breeding season is late with juveniles leaving the nest at mid-August in lowland sites and through into early September at upland sites. More limited observations in Scotland suggest a similar lateness there. While a few adult Honey-buzzard do leave Northumberland at the end of August or in early September, many birds hang on to mid-September to look after the young of the year before departing. By this time as observed above thermals are getting weaker and the duration of strong sunshine in the middle of the day is becoming very brief. The birds therefore may well turn to orographic lift to facilitate their escape. The obvious source of orographic energy is the Pennines, which conveniently runs N-S in the desired direction for the exit. The SW Northumberland study area for Honey-buzzard lies just N of the North Pennines, with some of the valleys in the study area (Devil's Water, Allen, upper South Tyne) also oriented N-S. The prevailing wind in the area is westerly (SW in warm front, NW in cold front) in September and the wind is often strong at this time, with breezes of 20-35 kph commonplace. Hence there is a strong updraught on the E side of the valleys in the Pennines, which might support the birds' flight for the 180 km of the length of the Pennines, from just south of Haltwhistle/Hexham/Bywell in the north to the Peak District in Derbyshire in the south. If the wind was steady enough the birds could actually move onto the extreme W of the Pennines and ride the ridge lift on the steep slopes of the dramatic Pennines escarpment. In W/NW winds following rain, the visibility is normally very good, encouraging the birds to be more adventurous. These ideal conditions occur after the passage of a cold front as is well known to raptor watchers at Hawk Mountain in the Appalachians. The heavy overcast conditions cited above for the Appalachians will only occur very briefly after the passage of a cold front in northern England. For strategy the birds will wait for good conditions of a clearance in the weather on W winds but what if these are not forthcoming. It is believed that 2000 and 2008 were years in which the birds decided they could wait no longer to get away. As the weather cleared to some extent the winds were easterly. It could be argued that the birds could go to the E side of the Pennines for orographic lift but there are a number of reasons why this is not possible. Visibility is often very poor in the Pennines on E winds making navigation difficult. And E winds often do not have the body of W winds making reliance on them for orographic lift more hazardous. Even during normal hunting the birds are very reluctant to get up in E winds and ride the ridges in the same way as they do in W winds. Further there is no clear escarpment on the eastern side of the Pennines: the moors tend to merge more gently into the lowland areas than on the western side. So the birds move towards the coast where in Durham and Yorkshire they can get orographic (obstruction) lift from the E winds flowing over the sea cliffs. Further south the cliffs are replaced by sand dunes through Lincolnshire but there will still be some lift from the wind striking the slightly elevated shore, or even buildings. In Norfolk and Suffolk the birds can either carry on following the shore or cut across the land: energy-wise there is probably little difference. The lift the birds get here is exactly that obtained by gulls such as Herring Gull, Lesser Black-backed Gull and Great Black-backed Gull which enables them to glide along the coast effortlessly at right-angles to the E wind. Indeed confirmation of this idea came to me in a recent visit to Teignmouth, Devon, in November 2011, when I saw the large gulls effortlessly gliding past at right-angles to a strong SE breeze. There is also a navigational bonus to be obtained from following the line of the coast: the birds will not get disoriented in poor visibility. The relief map shows the suggested migration routes across the UK from major Honey-buzzard breeding concentrations. These routes are a modification of the Southwards Model (section 1.1) to reflect the fact that while the movement is basically south, it may lean to the west or east depending on the wind direction. Perhaps counter-intuitively the birds move to the W in westerly winds and to the E in easterly winds, because of the goal of maximising orographic lift. The routes are broad-brush: false precision has not been attempted. Route W shows the ideal western route using orographic lift along the W side of the Pennines and ending up in the Isle of Wight area before crossing the Channel to Normandy and the Channel Islands. This is a very favourable route from the energy point of view and also safe as it avoids the perils of the SW peninsula which slopes away into the Atlantic, potentially encouraging birds into a hazardous long ocean crossing to France (or even Spain). Route E shows the northern part of the eastern route adopted in 2000 and 2008, making use of the orographic lift from sea-cliffs and to a lesser extent from the shore. Route E splits into E1, that adopted in 2000 and going through London and Sussex to Normandy, and into E2, that adopted in 2008 and going through Norfolk and Suffolk to Benelux. Route S is plotted from the Tay Valley, a very significant area nationally for Honey-buzzard, across the Firth of Forth at Queensferry and then splitting into at least two routes, one (S1) going almost due S coming into the Haltwhistle/Alston area of the North Pennines and the other (S2) going further E coming into the Tyne Valley E of Hexham. Both S1 and S2 are safe; a more westerly route such as that observed for birds satellite-tracked from Inverness is too close to the Atlantic for comfort. There is another escarpment further south in England, the NW flank of the Cotswolds stretching for 70 km from Chipping Camden to Wotton-under-Edge, largely along the line of the Cotswold Way. This could provide further assistance for birds as they moved S from the England Midlands, though not all birds would want to be this far W as they approach the Channel, with a crossing potentially starting at Portland Bill in Dorset, some way W of the shorter water crossing from Isle of Wight to Normandy. Three sources are relevant, each of which is discussed in turn. The autumn migration takes place in a roughly 50km broad corridor between south west Skåne (Falsterbo) and the island of Fehmarn, southwards over the Danish islands. Thereafter the route is southwest towards Hamburg, and then quickly fans out. Each year some 50,000 Common Buzzards and 10,000 Honey-buzzards pass rapidly through East Holstein. If the prevailing westerly winds switch to the east, the route is diverted westwards and this can result in Honey-buzzards for example being deflected as far as over the North Sea, where they then correct their course by flying back towards the mainland before continuing south. Two-thirds of the Honey-buzzards migrating over Fehmarn and East Holstein pass through between 26 August and 7 September, and years of observations have shown that most pass the Fehmarn area between 10:00 and 14:00 hours. Honey-buzzards usually travel in small groups. Common Buzzards migrate somewhat later. A few migrate in early September, but the main migration starts in mid-September, peaking at the end of September and the first week of October. Some 85% pass through Fehmarn and East Holstein between 26 September and 16 October. Mass migration is commoner than for Honey-buzzard, although Common Buzzard also mainly migrate in smaller groups of up to 100 birds. The second paragraph (my bold) is very critical: Honey-buzzards actively resist the potential for drift across the North Sea. The birds realise the risks of death or exhaustion are very high in a long sea crossing. Because the ground is flat across the corridor the birds cannot employ orographic lift to facilitate their progress and do drift across the land to some extent. 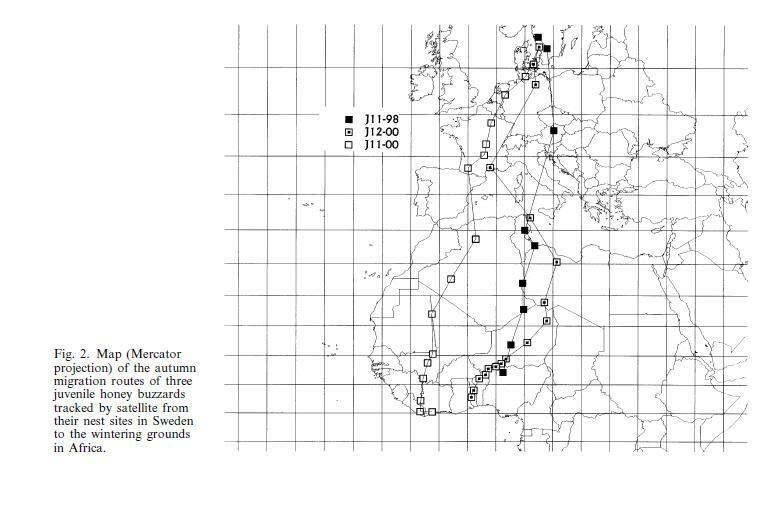 The map of Honey-buzzard juvenile migration routes from Sweden in a paper by Thorup et al (2003) is very revealing. It shows a narrow migration path moving SSW for the sample of 61 birds, across the base of Denmark, then mainly through Germany and eastern extreme of Netherlands, concentrating to east of Pyrenees and Italy before crossing Mediterranean to Africa. There is no significant westward drift with just one record in the UK and none in western France and nearly all of Iberia. 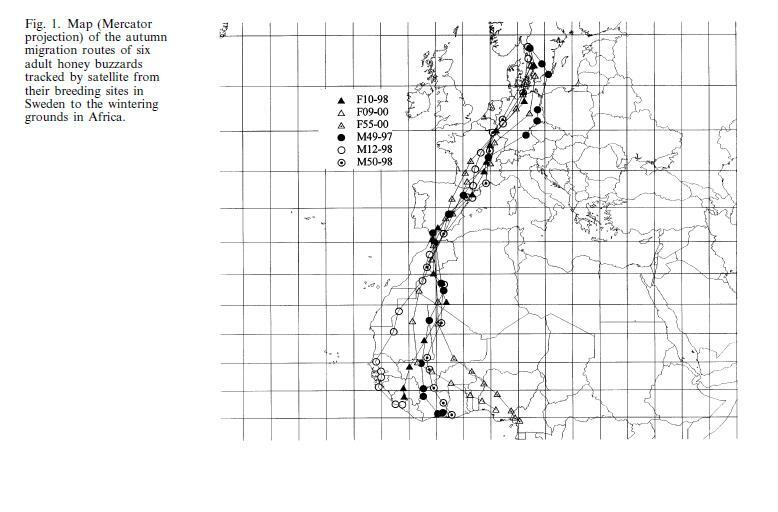 From satellite tracking, a second paper from Lund (Hake 2003), confirms the narrowness of the migration routes of adult Honey-buzzard in a SSW direction across western Europe. Juveniles wander a bit more but their direction is more south, rather than tracking W to Gibraltar, making it very unlikely that they will cross the North Sea. Further information supporting Génsbøl's experience can be found from results obtained at Helgoland, an island in the German Bight, showing that the small numbers of Honey-buzzard occurring in autumn 50km off the German coast move predominantly in directions back to the continent with none moving W or NW, which would be the directions necessary for birds to reach northern England. Dierschke (2001) discusses the occurrence of raptors on Helgoland, 50 km off the German Wadden Sea coast in the North Sea,in the context of regular migration or wind drift. Most raptors were seen in SE/E winds, apparently blowing the birds off the coastline which they usually followed. Larger species, particularly Honey-buzzard and Common Buzzard, therefore appeared to arrive due to wind drift but their direction of departure suggested they were actively correcting for it. No age effect on wind drift was detected as the percentage of immature birds resembled that observed at Falsterbo (Sweden). The position of Helgoland is shown on the map. It it in a very strategic position to assess wind drift in raptor migration from the Jutland peninsula. Table 2 in the paper is the most significant for the purposes of discussion of whether Honey-buzzard cross the North Sea. It shows 223 Honey-buzzard were recorded in autumn over the ten years 1990-1999, which at about 22 per annum is very low compared to the numbers passing though Denmark but higher than the author expected. The flight direction over Helgoland in autumn is very revealing: 83% are steering in a direction to avoid a trip over the North Sea (58% S, 17% SE, 1% E, 5% NE and 1% N; note rounding problems) and only 17% are going SW, which if maintained would bring them to East Anglia. Moving SW, however, does not mean that a North Sea crossing is inevitable by any means. The birds could be looking for landfall on the German coast to the west or in Friesland in Holland. None are going W, which if maintained would land them on the Yorkshire coast. Neither are any going NW, which would be the necessary direction to arrive on the Northumberland coast. Comparing the results with those for Sparrowhawk, Kestrel, Osprey and Merlin, which we know cross the North Sea, we see the percentage going SW as much higher at between 71-77% with active resistance to drift lower at 1-12%. Sparrowhawk in particular is quite common as well with about 68 birds per annum in autumn. The Honey-buzzard is the only species of those listed with no W/NW component. Arrival of Honey-buzzard on Helgoland in autumn is very strongly associated with E winds. so some migration (intended and/or involving wind drift) over the North Sea does occur. No Honey-buzzard went W/NW, the directions necessary to make landfall in Yorkshire and Northumberland respectively. Honey-buzzard and Common Buzzard are the two species thought most likely to be resisting wind drift. Species we know cross the North Sea frequently (from ringing and oil rig records) have a much more marked tendency to move SW (over 71% of birds), were less likely to be avoiding wind drift and also moved W/NW to some extent. A report on the Dalsland study area for Honey-buzzard was published on the Internet (http://www.ilmo.se/) but the web page is no longer extant. The report was mainly in Swedish, but earlier versions of site were in English. The breeding population was estimated as 5,000-6,000 pairs for the whole of Sweden in 1989. In the seven years 1993-99 there was a strong negative trend with population down about 3-4% per annum and now under 5,000 pairs. Over a longer time span the population is apparently down one-third since 1986. In Dalsland, Sweden, the breeding population has fallen from 120-140 pairs in 1990 to a maximum of 100 pairs in 2000. The numbers of juveniles ringed has declined in the 1990s in Sweden from c40 in 1990 to just under 20 each year from 1997-99. In Dalsland 95 juveniles and three adults were ringed from 1992-98. In very recent work in Dalsland on 16 nest-plots, a number of active nests were found and monitored in 1999 and 2000. In the first year no young were fledged from five nests, in the second an average of 0.33 young was ringed per nest from nine nests. The comment for 2000 is: "Another year with very low reproduction level. But this year (as opposed to 1999) some breeding succeeded .... the results from the two latest years may be caused by not only food shortages but probably even that birds from our controlled plots have alternative plots/nests outside our control?". The downward trend continued until 2007 when six pairs raised just one young. But overall there seems to be some bottoming out of the decline in recent years and, to give some hope, 2008 was better with 9 young from 8 pairs. The density of pairs was however quoted as declining from a maximum of 7 pairs per 100 sq km in 1992-94 a maximum of 3 pairs per 100 sq km in 2006-08. The Annual Report of the Dalslands Ornitologiska Förening for 2010, Dalslands Fåglar 2010, indicates a density of just 1-2 pairs per 100 sq km compared to 7 pairs per 100 sq km from 1992-1995 (http://www.fåglarpådal.se/wp/wp-content/uploads/DOF-Rapport-2010.pdf). From the account by Svensson and Tjernberg (2005), it was noted that the species is generally more common in the eastern parts of Sweden than in the west and is very sparsely distributed inland in the north. In the early 1980s the Swedish population was estimated at 8,000 pairs, but was thought to be significantly less, around 5000 pairs, by 2005. The annual autumn migration counts of Honey-buzzard at Falsterbo were on average 12,700 birds 1973-1980, 7650 1981-1990, 4500 1991-2000, 2800 2001-2003 (information from Nils Kjellén). According to Falsterbo figures Honey-buzzard has thus fallen by 50-70% in the last 30 years. In Norway only small numbers of Honey-buzzard are found in the south-east, a sharp decline having occurred in the last century, while in Finland the Honey-buzzard occurs in the south up to 67 °N, with 3000-4000 pairs, a decline of 20% in 1990-2000. In Denmark there are about 600-700 pairs, concentrated in the deciduous forest-rich eastern parts of the country. The European population is estimated at at least 110,000 pairs of which about 70,000 in Russia. Reproduction in eastern Svealand 1986-91 was 0.6 young/pair studied (n = 99) and the proportion successfully breeding of all the couples studied was 35%. A high proportion of young Honey-buzzard are captured by Goshawk and Pine Martin (over 20% in East Svealand 1986-1991). The low reproductive rate is compensated by an average long life. The oldest known wild Honey-buzzard was 29 years old. Another report from ArtDatabanken by Svensson and Tjernberg (2003) deals with national conservation in 2001. The Honey-buzzard was thought to breed in all counties except on the island of Gotland; the Swedish population had fallen more or less continuously for at least 30 years and while difficult to predict, was thought to now be no more than 5 000 pairs in the country. Honey-buzzard is red-listed in Sweden, meeting the criteria for Endangered. However, the disappearance risk could be downgraded to Vulnerable based on relatively good presence, although partially reducing, in the rest of Europe, as this offers the opportunity for re-immigration. Bird Life International describes the Honey-buzzard as Secure in Europe. The aim in Sweden should be to stem the continuing decline observed over a long period and eventually to regain a population size that is in the vicinity of where it was in the 1960s and 1970s (at least 10,000 pairs). For this to succeed, measures must be implemented both domestically and internationally. So from the 1970s-2000s Swedish population and productivity is in rapid decline, giving very few juveniles to come here, and UK migration numbers soar. When the Swedish population was perhaps double or even treble that of today, we had virtually none. For instance in the 1950s (Nicholson et al, 1957, pp.141-142), it was stated: “Records of birds [Honey-buzzard] on passage are very few and irregular”. Therefore at a time when the Honey-buzzard did not breed in Britain, there was no passage in the UK, even though the species was much more plentiful in Sweden than now. Further, this is not an observation problem: the Rough-legged Buzzard is reported by Witherby (1944, ref) as “occurs most years ... and at intervals in considerable numbers”. The recent sharp fall in Norway's Honey-buzzard population is also of interest, suggesting that this country is very unlikely to be a source of migrant Honey-buzzard in the UK. In a recent paper by Bijlsma et al , an analysis (p.173) was made of the published data from a number of countries. In Sweden numbers at Falsterbo on passage have been more or less stable since the 1990s at some 35% of the 1970s level. In Finland between 1982 and 2008 there was a highly significant decline of about 2.8% for territories and 4.2% for nests. In Germany overall there was a significant decline of 3.1% annually from 1988 to 2002 but with some recovery in 2003-2006. In the Netherlands there was a decline of about 20% between the 1980s and the early 2000s. In contrast stable figures have been reported for France up to the early 2000s; the authors quote stable passage numbers from the 1980s-2000s at Organbidexka in the western Pyrenees as support for the stable trend in France. About half of the total population is thought to breed in Russia; stable migration counts in Israel suggest this important population is not in decline, Counts at Mediterranean bottlenecks in spring show a mixed picture with a steep decline in passage at Gibraltar of 54% from pre-1980s to post-1980s, another steep decline of 56% at Cap Bon, Tunisia, from 1970s to early 1990s but an increase in the central Mediterranean. Reasons for the decline include 1) poor adult survival, perhaps because of degraded habitat in west Africa where the western European population overwinters; 2) predation of young birds (chick, juvenile) and adults by Goshawk and Pine Marten. Food shortage has also been mentioned by several writers. Perhaps surprisingly neither habitat degradation in Europe nor the use of pesticides/herbicides is discussed in detail. 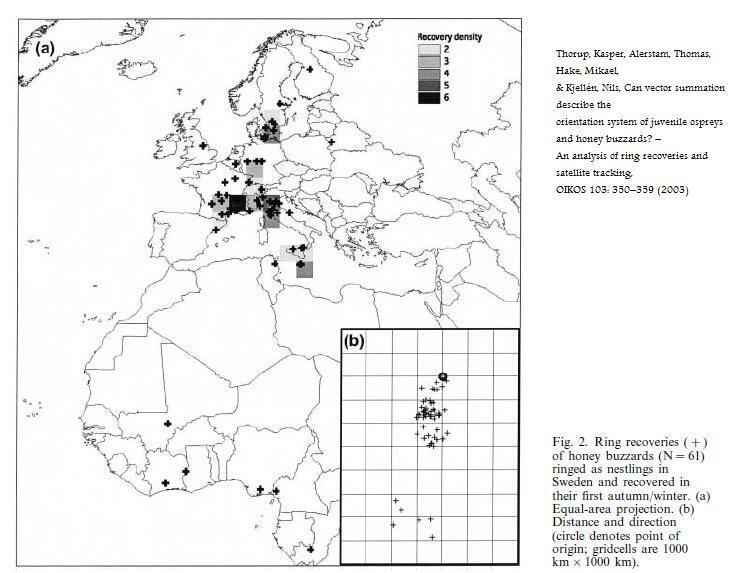 Bijlsma et al  also analyse recoveries from schemes dating up to 2005 from 6895 ringed Honey-buzzard in 7 European countries: Belgium (150 ringed), Denmark (352), Finland (3335), Germany (1161), Netherlands (868), Sweden (1012), Switzerland (17). Dead recoveries totalled 235 but very small numbers were in the UK. Indeed there are only two recoveries of foreign-ringed Honey-buzzards in the UK in the period of the scheme: from Germany in 1973 and Sweden in 1976. Only one Honey-buzzard has been seen in 21 years of bird recording on North Sea Oil Rigs. This implies that birds very rarely cross the North Sea. The fanciful suggestions on why there has been a recent increase in Honey-buzzard migration in eastern Britain look unlikely to be valid from a scientific viewpoint. Ideas that the birds may have arrived on a 600 km journey across the North Sea, in effect the N model and the Spiral Model, imply a use of energy and a risk to the birds that is most unlikely. Rather it looks much more likely that the UK breeding population of Honey-buzzard is much higher than expected and that the birds in autumn normally employ orographic lift on the prevailing W winds down the spine of England to move S, much as in the Appalachian Mountains in North America. In continuous poor weather, often on E winds, this route is not available and the birds move instead down the east coast of England, both for navigational purposes and for orographic lift along the cliffs. The idea that the birds have a Scandinavian origin also looks likely to be fanciful. Scandinavian populations are declining while UK movements are increasing sharply. Studies on the ground, at migration points and through satellite tracking of marked birds, confirm that Scandinavian-bred birds strongly resist drift to the W. Other possible sources for Honey-buzzard to migrate across Britain have also experienced population declines over the last 30-40 years. Ringing recoveries and records from the North Sea imply that birds very rarely cross the North Sea.